Popdose Flashback '91: Material Issue, "International Pop Overthrow"
When Material Issue front man Jim Ellison committed suicide in June of 1996, the act was sharp and sudden. The 32-year-old wasn’t a stereotypical grunge sad-sack. He was an anachronistic rock vocalist who sported clean-cut looks, tight jeans, leather jackets and pin-up swagger — all in an era when looking scruffy and damaged had greater cachet. To this day, why he committed suicide is a mystery to the general public; it was reportedly over a broken relationship, but the contents of a suicide note remain private. Still, Ellison’s death retroactively colors Material Issue’s three albums. (The catalog numbers four if you count Telecommando Americano, an album the band had just about finished before Ellison died that was released posthumously.) And that’s a shame, because the Chicago trio deserves better than to be known as a band whose career had a premature expiration date. 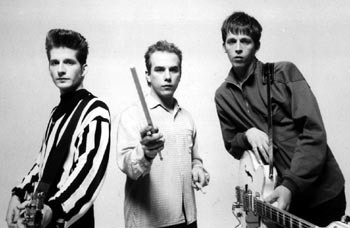 Growing up in Cleveland, regional bands such as Material Issue were a steady presence on the radio. I especially loved the creepy 1994 jangle “Kim the Waitress,” which received heavy airplay. (I didn’t find out until years later that it was a cover of a tune by the Green Pajamas.) But other Ish tracks popped up every now and again: “What Girls Want,” “Valerie Loves Me” and “Diane.” That triumvirate was contemporary to the power-pop which scraped the mainstream in the first half of the ‘90s – Jellyfish, Hoodoo Gurus, Gigolo Aunts, early Blur. As of 1992, I was a newly minted R.E.M. fanatic, and I couldn’t get enough of music filled with hooks and harmonies. The album is also abstractly indebted to early R.E.M., “Li’l Christine” especially — although the Ish always sounded like a winsome college-rocker dolled up in glam’s glittery accoutrements. (In fact, they were known for covering Sweet’s “Ballroom Blitz” live.) While Overthrow’s production sounds distinctly of-its-time – it has that slightly-tinny, slightly-hollow sheen found on many early ‘90s albums – the songs’ details are timeless. Ted Ansani’s harmonies waterfall all over “Diane” and “Chance Of a Lifetime,” while his bassline on “Valerie Loves Me” is taut. Drummer Mike Zelenko’s grandfather-clock rhythms tick through “Very First Lie,” and he helps “Trouble” and the title track become amped-up rock joyrides. In fact, the album is a near-perfect debut; only the syrupy ballad “A Very Good Idea,” which sounds like a cutting-room-floor Replacements, sounds a bit clunky today. Yet “Idea” is wholly redeemed because of its lyrics. It’s a devastating song, really, in which the protagonist begs, “I think it would be a very good idea if you didn’t break my heart.” It seems like the other party didn’t heed this advice, leaving a teenage-sounding Ellison to whisper, “Don’t break my heart – tear this apart.” The “insecurity” mentioned in the song’s first line permeates the song – the main character senses the break-up is inevitable and maintains a defensive tone throughout. In other words, Overthrow isn’t your usual bouncy pop album sulking over pretty girls. It isn’t full of carefree laments or simple tales of relationships-gone-sour; the album’s characters and relationships are burdened by guilt, regret and obsession. The person in “This Letter” is inappropriately hung up on an ex – he calls and hangs up, drives by the house, rings the bell and runs away — even while he says, “I’m only pretending you’re someone I know again.” How many people have held on to a faded relationship, simply because the thought of being alone was too painful? (Answer: Just about everyone.) But Ellison makes this complex emotional turmoil deceptively simple, almost matter-of-fact. And Ellison’s lyrics are subtle, so subtle that the ominous undercurrent is easy to miss. When he howls “Valerie loves me!” in the namesake song, what’s overlooked is that the girl in the song never acknowledges the affections of the boy in the lyrics — mainly because he apparently crushes on her from afar. And then when she’s “lonely in an apartment” and “her hair has turned so grey,” the boy now crows that “she can’t have me.” In a twisted bit of self-satisfaction, the tables have turned on the once-pretty girl. (Not that Valerie has any clue, still, about the vengeful admirer.) “Trouble” is about a rowdy example of revenge, which culminates in the protagonist ending up in jail. And “Renee Remains the Same” is cryptic poetry that’s ostensibly about not living up to potential, the sting of rejection and the pain of splitting up, all at once. Overthrow’s traces of sadness are perhaps most poignant. On the title track, Ellison motormouths, “Drivin’ in this van, playin’ in this band, you know it’s bringin’ me down” – but then immediately notes how being onstage perks him up. “Very First Lie” is even more cutting. The character outlines all he wants to do with a beloved – wake up early in the morning, play records together “on your phonograph,” meet family – and then ends the list with the line, “[and] maybe just once pretend to be somebody’s better half.” That tossed-off wistfulness is a sucker-punch; the list preceding it must be the daydream of a perpetually lonely person. But then it’s immediately followed up with, “I would like to tell the very first lie.” You could take that as a magnanimous gesture – he’s willing to screw up first in the relationship, so he’s in the position of needing to be forgiven – or an act of self-sabotage. (Think about that, though — the protagonist is already imagining the self-inflicted cracks in a hypothetical relationship.) Or maybe the lie is one he tells himself – that he could even be capable of finding such idyllic times with another person. Either way, the implications are sobering. To prep for writing this article, I read a lot of remembrances about Ellison’s life and even a few interviews with him. By many accounts, he wasn’t an easy guy to know, although the kindness he showed to fans and friends came up time and time again. But these articles underscored the importance of Overthrow. The album represented a triumphant time for the hard-working band — an appearance on MTV’s Spring Break(! ), slots on other late-night talk shows, music videos in rotation, sales up over 300,000 – and helped pave the way for later tours with the Pretenders, Simple Minds and INXS. Above all, Overthrow‘s exuberance is unfettered by the long-term future – it brims with youthful energy that’s deeply felt, but not paralyzed by its despair.